Happy Father’s Day Babe. 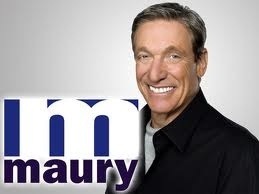 Who knew I was getting so lucky when Maury pulled your name out of that envelope. Love always, your Baby Momma. This entry was posted on Sunday, June 17th, 2012 at 10:23 am	and tagged with Baby, Father's Day, humor, Maury and posted in Uncategorized. You can follow any responses to this entry through the RSS 2.0 feed. Oh, okay. This is how it happens. Well, as long as you decide to take care of yo kids. Babies like Dr. Pepper in their bottles right? And if they get fussy you can put a jolly rancher in a Zima and give them that. Can you still buy Zima, or do they only sell it in fancy European baby stores? exactly, in fact my baby bjorn has a zima koozie sewn onto the side of it. Ah, Maury… Always bringing people together. In front of a live audience. Ah, Simon your better (I mean other) half speaks. :). Oh no, better for sure. Thanks! You know what they say, behind every good man…you’re welcome and kudos to your BETTER half. :). without question, she is the best. Yeah, she is funny like that.